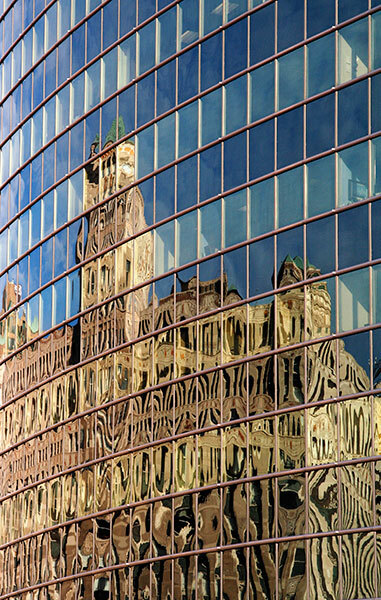 The massive stone structure of the Merchandise Mart of 1930 is reflected in the curved façade of 333 West Wacker Drive completed in 1983 to designs by Kohn Pederson Fox. The former was built by Marshall Field and Company as a vast depot to supply goods to the whole country. Its art deco related interior has been restored. This tall glazed drum stands at the corner of its more conventional parent building on North Michigan Avenue. 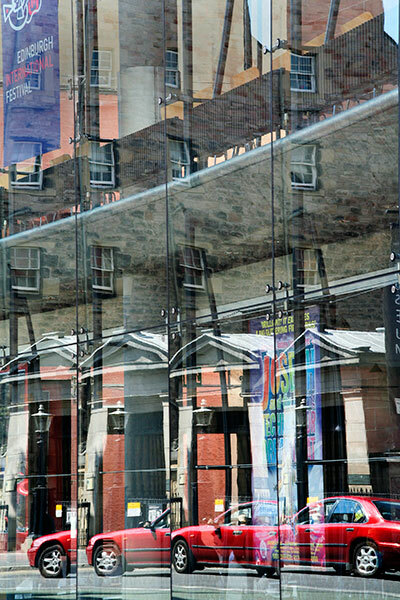 I liked the duality of architectural reflections and interior view. Murphy/Jahn designed the Citicorp Building completed in 1987. It replaced the 1911 terminal buildings of the former Chicago & North Western Railroad. Escalators in the dramatic entrance atrium lead directly to the passenger concourse. Impressive at rush hour times, the sixteen gates open to platforms in the original train shed restored by Metra in the early 1990s. It was renamed the Richard B. Oglivie Transportation Center in 1997. 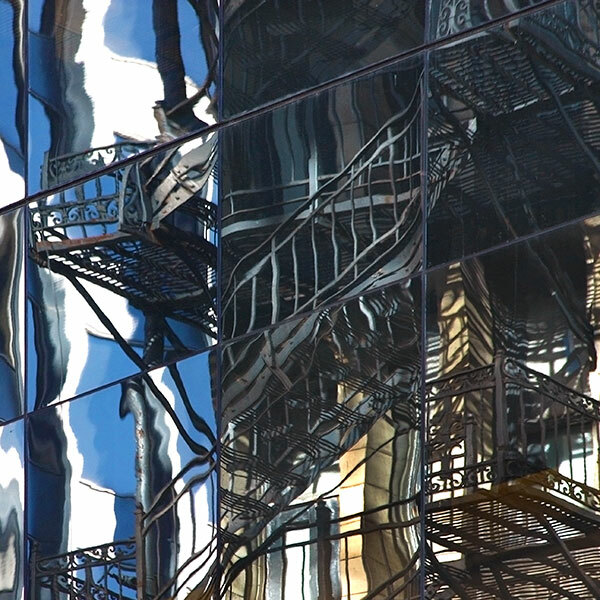 A fire escape caught as a reflection in the glazing of an unrecorded building in the State and Madison area of the City. With hindsight and, given more time, I should have hunted for more images for both themes. 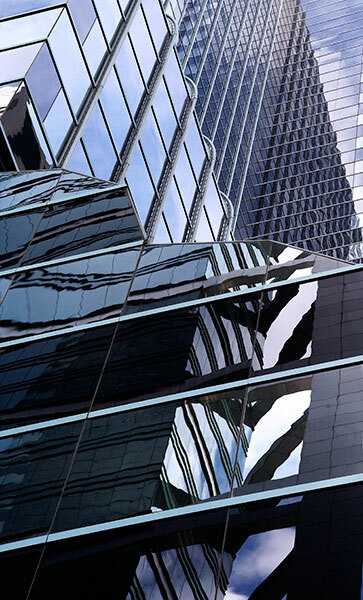 There are plenty of the former and the range of architectural details carried in curtain wall glazing would keep anyone wielding a camera very active for some considerable time. Edinburgh’s original Empire Theatre on this site was designed by Frank Matcham and opened in 1892. After a chequered career it reopened in 1994 as the Festival Theatre. The auditorium was restored and from the street it has been transformed by a new frontage set behind a curve of flat glass panels. 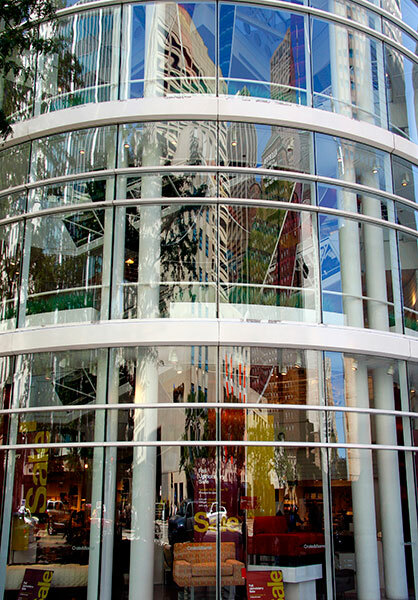 Three dimensional glazing around the entrance offers intriguing possibilities for reflections. 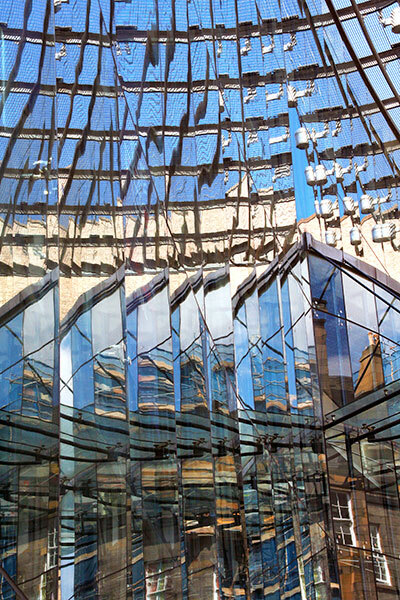 The acute angle perspectives and the more elaborate glazing to the central façade act as a kaleidoscope as each step slightly changes the walker’s relationship with the individual glass panels. 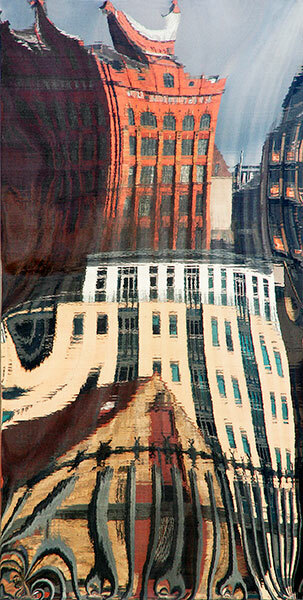 This and the previous image splinter the street reflection into narrow shards of colour and detail. The Newcastle United football stadium stands high and is close to the city centre. Here it’s reflected in the Citygate building across the street. The STRUCTURES - ST JAMES’ PARK gallery is devoted to a collection of images concentrating on the steelwork overlooking Barrack Road. The Emerson Building dates from 1903 and was completed to the designs of Benjamin Simpson. Grade 2 listed, it rises five storeys to an intricately structured roof. Richly detailed and decorated, it references Classicist, Baroque and Art Nouveau styles. 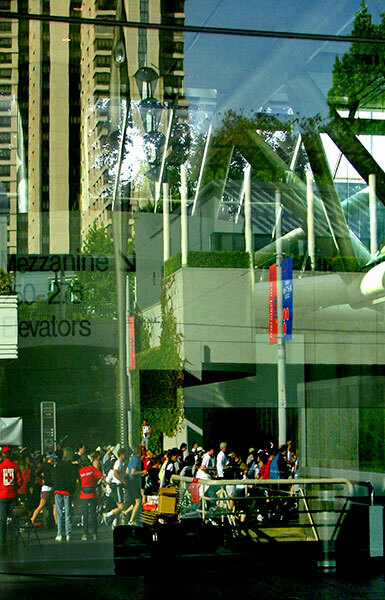 This image looks through two corner windows and incorporates reflections, reflections of reflections and the buildings beyond. The Gate is a leisure building incorporating a cinema, bars and restaurants opened in 2002. 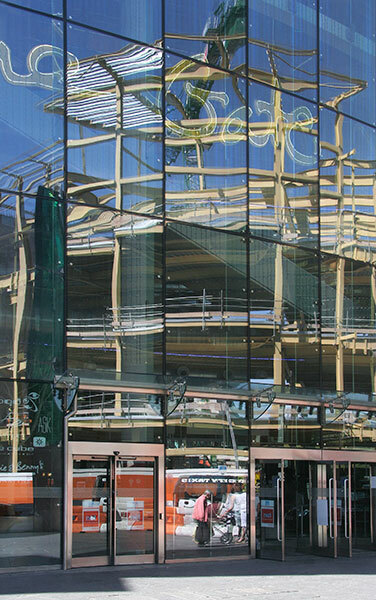 It stands on a curve on Newgate Street ready to carry reflections on its glass façade. Here, it reflects the steel skeleton of a new building under construction. 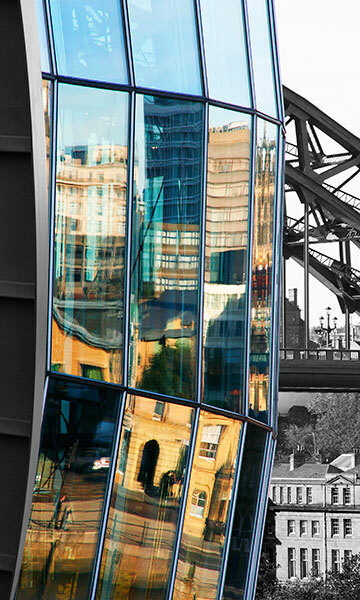 In late afternoon sunshine, fragments of buildings on the Newcastle bank of the River Tyne reflect in the glazing of The Sage Gateshead. Completed in 2004 to designs by Foster & Partners, its curvaceous form encloses three music performance spaces, rehearsal studios and generous public areas. The Tyne Bridge stands beyond. 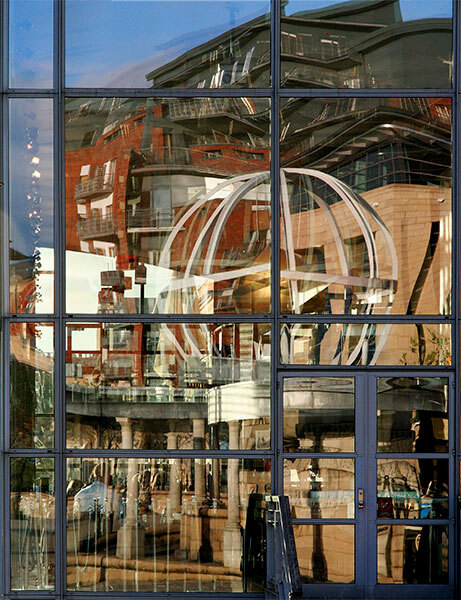 For some time Gateshead has actively pursued an arts related development programme that includes The Sage, the Angel of the North, and the Millennium Bridge as major structures. This "Rise & Fall" sculpture by Lulu Quinn stands below the High Level Bridge as part of the Art on the Riverside scheme. Here, its bright metal reflects the late nineteenth century brick Turnbull Building, a recent apartment block and a half timbered brick and stone commercial building (c17th C) across the river. 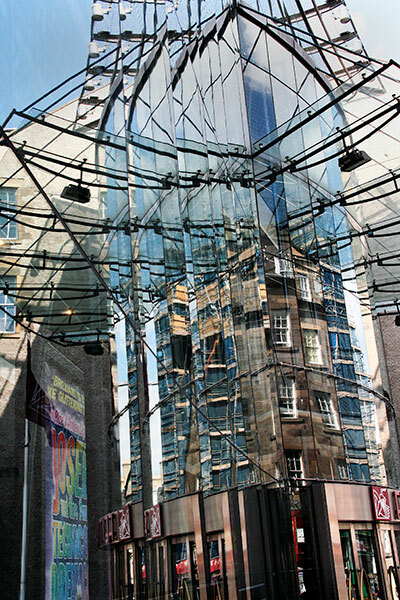 Designed by Panter Hudspith, the stone-backed steel and glass Pitcher & Piano restaurant and bar was completed in 1997. It stands at the northern entry to the unique Millenium Bridge across the Tyne leading to the Baltic Centre for Contemporary Art. 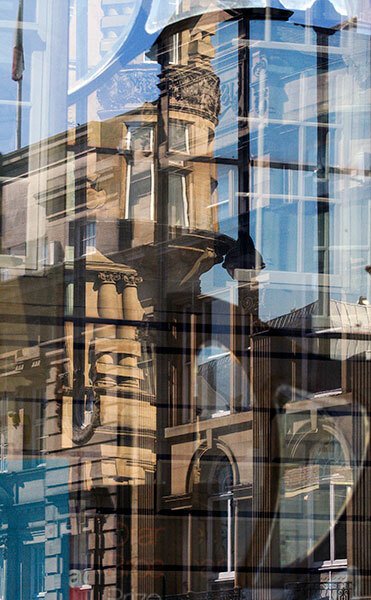 Its eastern gable reflects "Swirle Pavilion" of 1998 by Raf Fulcher backed by the tall massing of office and apartment blocks. The "Bay to Breakers" footrace follows a 7.5 miles long street route between the Embarcadero near the Bay Bridge and Ocean Beach near the Golden Gate Bridge. Established in 1906 it can now attract over 100,000 runners to participate on the third Sunday in May every year. 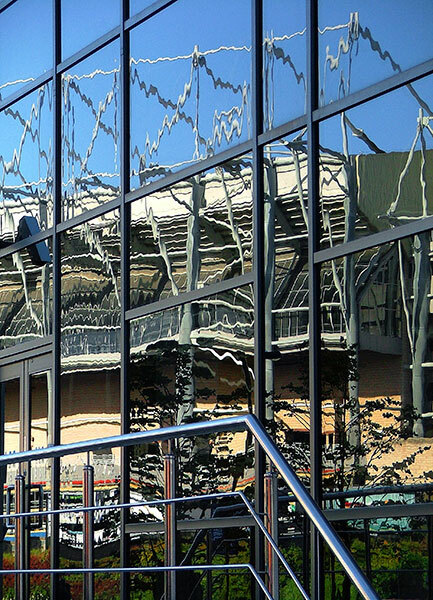 These reflections were in the Moscone Center on Howard Street. 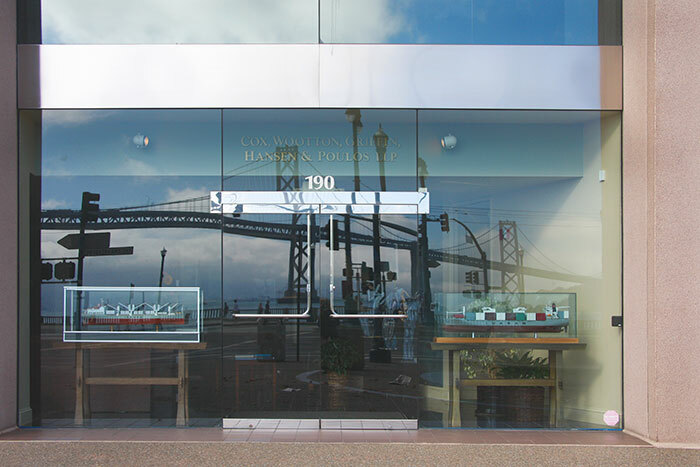 On a pre-breakfast waterfront walk to the Bay Bridge I passed this office that I recall housed a law firm with maritime interests. My main purpose was to photograph the bridge and some adjacent buildings in the dawn light. Some of the resulting images appear in the SAN FRANCISCO BY THE BAY BRIDGE gallery. 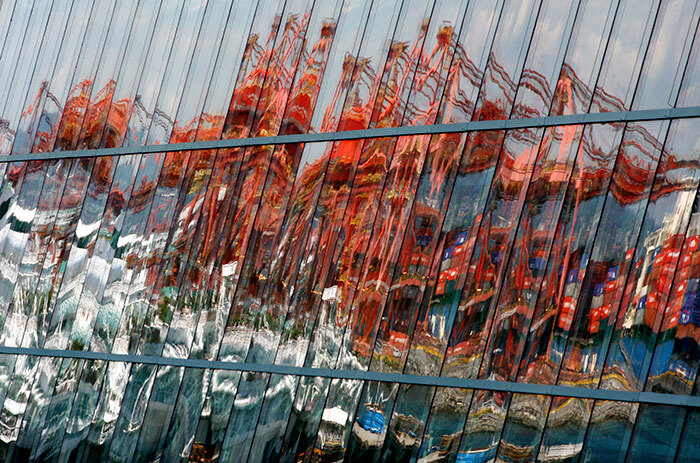 The cranes dominating the Vancouver Container Terminal are reflected in the glass of an unrecorded façade. Commerce Place was completed in 1986 to the designs of Waisman Dewar Grout Carter Incorporated. The setback surfaces reflect themselves as well as the adjacent buildings. 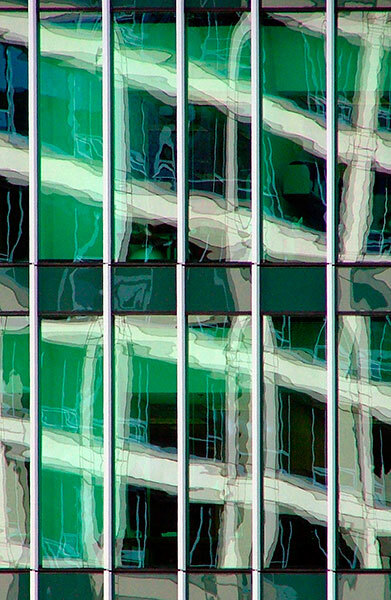 For a colourful interpretation of this building from another photograph look at Image 16 in the ABSTRACT IMAGES – BASED ON ARCHITECTURE gallery. 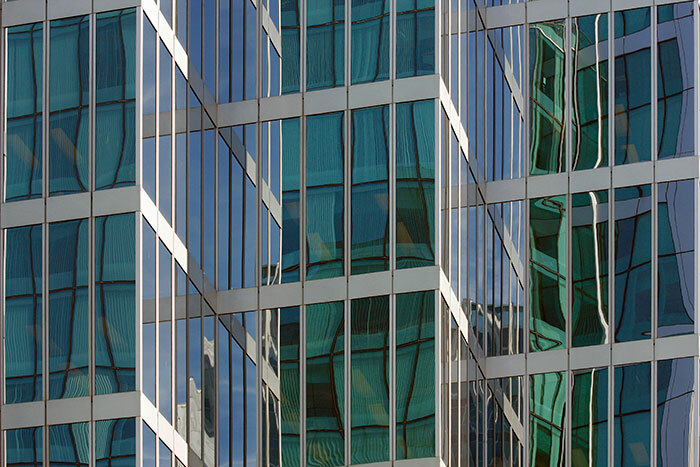 These reflections are framed in a fragment of the PricewaterhouseCoopers Place building completed in 2003 to the designs of Kirkor Architects and Planners.